If your installation is subject to an attack from being an open-relay through mis-configuration, or through a virus or Trojan infestation, you can have a situation where there are many thousands of messages in the outbox. A similar problem can be manifested in the Pending folder. You can use these same techniques to clear a choked Pending folder. 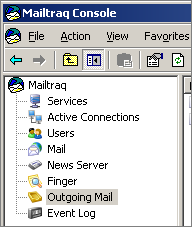 If the Outgoing Mail 'outbox' becomes choked with messages it can be impossible to remove them from within the Console, or if Mailtraq is shutdown it can be very slow to open the Console as Mailtraq attempts to load the messages into view. This procedure involves manipulating the Mailtraq files 'behind the scenes'. Whenever you are working directly with Mailtraq's files it is important that Mailtraq is shut-down to avoid possible database corruption. Mailtraq expects to have sole access to it files at all times. If you are working with the file structure you may lock or move a file that Mailtraq expects to have access to. It is important to have a regular backup routine for your installation so that you can recover easily if necessary . If your installation is elsewhere you will need to adjust the Path:\ to suit your situation. Take a safety *backup copy of the Database folder and place it somewhere safe. Check the \pending folder (see below). Mailtraq will now resume operation normally, recreating a new Outbox on-demand, but all messages in the outgoing mail will have been removed. You must decide whether to simply discard the folder now called 'outbox-old', and all the messages it contains, or to try to sort through the folder to remove any valid outbound messages from the spam. If you choose to find the 'good' messages, you may find it helpful to sort the folder by file-size. It is usually the case that the messages stuck in the outbox are spam, and they are all the same message. You can then delete these files. You can re-route any valid messages you find by placing them in the Pending folder - Mailtraq will then send the messages in the normal way. It is very important to discover why your outbox had so many messages stuck in it, to prevent this situation from happening again. If you changed Mailtraq's safe configuration to accidentally become an open-relay then you can restore the default settings with reference to this page. If you think that the messages originated from one of the client machines on your network that had become compromised, an examination of the Event Log should indicate which machine is connecting and causing the problem. In any case, you should use this event as a prompt to change your User's Passwords. Care should be taken to follow the best password advice, and particularly pay attention to test User accounts that may have been used during the original set up. For example: a user called 'test' with a password of '123456', or 'admin' with 'password' and so on are very easily guessed and could be exploited. You should run a virus scanner on each of your client machines to clean out any Trojans. Mailtraq itself is immune from virus or Trojan attack. Once you are satisfied that Mailtraq is performing normally, you can archive or delete the safety Database backup. If you are in this situation due to an 'open-relay' spam incident, then you should also check the Pending folder, and proceed in a like manner. Messages arriving in Mailtraq are first routed to the Pending folder. In an open-relay attack many thousands of messages may be queued in Pending, which then get routed to the Outbox. If you do not also clear Pending, then as soon as Mailtraq restarts it can seem that the problem still exists - even if you have fixed the relay problem and emptied the Outbox.